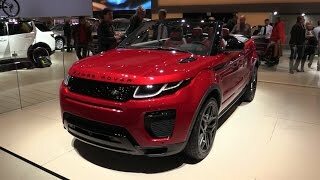 With its recently unwrapped Range Rover Evoque, Land Rover gained commendable eyeballs and appreciation and now at the Frankfurt Motor Show 2015 company re-rolled the dices with the remarkable Land Rover Range Rover Evoque Convertible 2016; the open top version of the model. Featuring better looks and maintaining the power figures, this model is speculated to rule the streets. 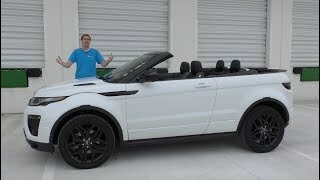 Let us have a look at the review of Land Rover Range Rover Evoque Convertible 2016 to know more about it. The interior of Land Rover Range Rover Evoque Convertible 2016 is similar to that of the Coupe version. This includes the dashboard configuration, bolstered seats and the sporty cues. However the front mounted gear shifter adds to the glory. Talking about the rear seats, here you’ll find some change as the seats are fixed. Talking about the trunk, it has lots of space as the folded roof finds its own cubicle once folded. Talking about the infotainment system the dashboard is loaded with a 10.2 inch touchscreen offering Wi-Fi connectivity to over eight devices and the new software enables the model to learn the daily routes and accordingly also suggest alternate paths to you. 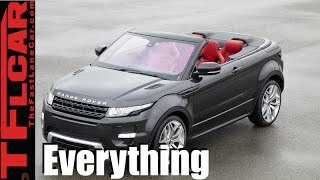 In all the interior of Land Rover Range Rover Evoque Convertible 2016 has everything that makes it one of the coolest and fastest open roof vehicle in the automotive market. The exterior of Land Rover Range Rover Evoque Convertible 2016 is basically the coupe version without the roof. However certain changes are inculcated; the grille gets comparatively larger openings while the LED fog lights add to the aggressive stance and yes not to be forgotten the body-colored side skirts adding to the looks and performance. From the rear end no specific change could be noticed, be it than the taillights or the trunk lid with the company’s name embarked over it. The wheel arches gets curvier adding to the aggressive stance. In all the exterior of Land Rover Range Rover Evoque Convertible 2016 looks sporty and aggressive rolling over the wheel options that range from 18-20 inches. 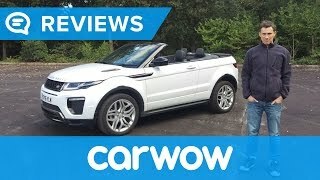 Beneath the hood of Land Rover Range Rover Evoque Convertible 2016 is a 2.0 liter 16-valve gasoline engine generating total output of 240 hp and peak torque of 340 nm paired to nine-speed automatic transmission. 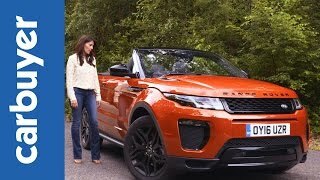 With this power the top speed of Land Rover Range Rover Evoque Convertible 2016 touches the mark of 112 mph while the 0-60 mph sprint can be knocked in 7.8 seconds.